Cloud Computing provides various services like storage, servers, software development platforms. It delivers hosted service over the Internet. Cloud computing services are commonly categorized as IaaS (Infrastructure as a Service), PaaS (Platform as a Service), SaaS (Software as a Service). Why KaaShiv InfoTech Company to learn Cloud Computing Training in Chennai? Kaashiv provides Best Cloud Computing Training in Chennai with professional trainers who provide real-time training and also projects to the candidates for better understanding. 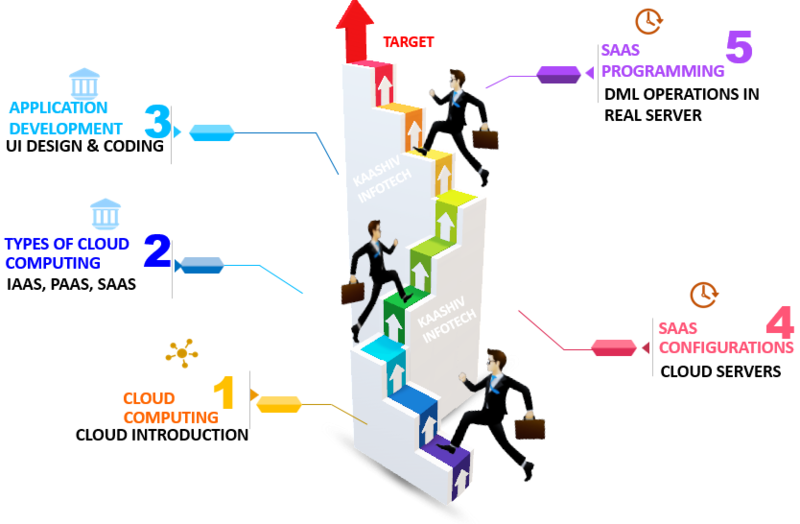 Why Students Enroll for real time CLOUD COMPUTING Course Training ? KaaShiv Infotech’s Course Training Programme molds your skills based on the above-mentioned technologies and places you in dream job roles from essentials to Advanced. We share Software guidance and materials for students throughout the year. Students from 1st Years / 2nd Years / 3rd Years / 4th Years / Passed Outs / Freshers and Professionals interested to learn. Students undergone Cloud Computing training will be expertise in Cloud servers, cloud computing coding , application development. For Cloud Computing Training 120 concepts from Basic to Advanced will be covered. Students will be turned experts by getting training in 100+ Programs.